This scam starts with a phone call from someone saying they're calling from the North Carolina Education Lottery (NCEL) and notifying you that you've “won” the lottery. They then tell you that you need to pay a processing fee, claim fee or a deposit to secure the prize. This also occurs with calls saying you've won a sweepstakes. A common version of this scam is being run out of Jamaica and is targeting seniors in NC and other states. This scam starts with a call notifying you that you've “won” a lottery or sweepstakes prize. The caller says they need to verify your identity to process your prize. They will ask a variety of questions – name, address, social security number, driver's license number – some or all of these. Then they may go a step further and ask for a credit card number simply to confirm your ID and promise they won't charge anything to it. All of this information can then be used for identity theft. How to protect yourself: Ignore any offer that seems too good to be true. There's no such thing as a free lunch or a prince sharing their lottery ticket or inheritance with you - and you don't have to be a citizen to win the lotto. When you're desperate for money, you may be willing to jump at anything that sounds like it can be a quick fix, but just say no. Delete the email, throw out the letter or hang up on the call. This scam occurs when someone offers to sell you a winning ticket because they don't have time to cash it in because they're leaving town, lack ID or some other excuse – the ticket may be a fake or for a lottery that's already occurred (and it's not a winner). Alternately, someone offers to sell you a scratcher or other lottery ticket that's a straight up fake, forgery or that's already irredeemable for some other reason. Approaches may be made in person, email or over the phone – perhaps in the parking lot of a store that sells tickets. 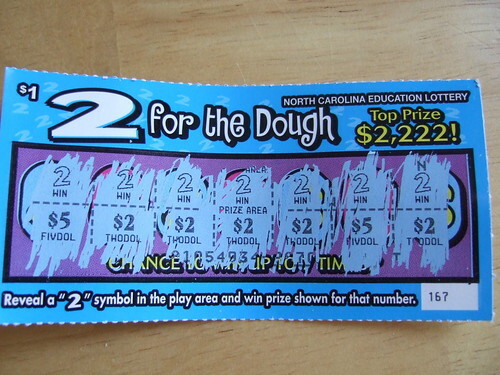 How to protect yourself: Only purchase lottery tickets directly from a certified North Carolina Education Lottery retailer and never an individual. No matter what the person says or offers, never buy a lottery ticket from someone else – it's not worth the risk. You can lose far more than just the few dollars a ticket will cost if you're taken in by this scam. If your finances are fragile or deeply in peril, contact the law offices of John T. Orcutt to find out if Chapter 7, 11 or 13 bankruptcy may be a fit for your circumstances to get you back on track and get a financial clean slate.